I found this book to be a very stimulating read. It closely examines how many of the things we do are different from the things that we say. It demonstrates how we are strongly ruled by our behaviours rather than our logic. Apart from the human interest aspects of this book I also found it very interesting in a business context. Many of the behaviours illustrates provide deep insight into the purchasing nature of people. It for instance demonstrates how powerful the concept of ‘free’ is to people’s psyche. The book is easy to read and written in a very engaging style. It contains numerous examples and intriguing experiments conducted by the author. If you are interested in understand how the human mind works and how behaviour is dominate over logic in most human experiences then this book is certainly a great read and high recommended. I have downloaded in and installed it onto a Windows 2008 R2 server without issues. The new release automatically downloads and installed the additional components it requires which is a change from the beta release. So far that is about the biggest change I can see but more information after some more testing. None of these appear to get installed automatically so I’m trying to install them manually one by one and then installing SharePoint Foundation 2010 RTM. At this stage, I’m not 100% sure it can be installed and am in the process of checking but I get the feeling that it probably won’t work or that some of the prerequisites may break other components of SBS 2008. I’d suggest that you at least hang off trying to install SharePoint Foundation 2010 RTM on SBS 2008 until I can run a few tests. 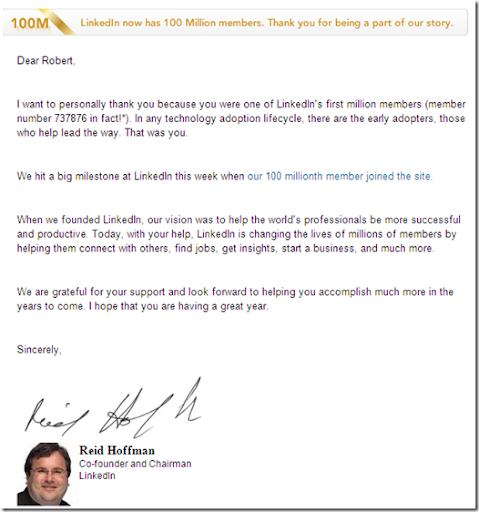 Above you’ll see an email I recently received from Linkedin telling me that they now have 100 Million users and that I was user 737,876. For many years after joining Linkedin I must admit that I really didn’t use it, but all that has changed of late. In many ways I think Linkedin has become the Facebook for business. Think about it, Linkedin can give you access to 100+ million people. Now who wouldn’t want that tohelp their business or career? I am still amazed at how many people I know that don’t use. It is not that it costs anything as well as providing a place for you to create an online CV, Linkedin is now so much more than that. It is way for me to stay connected to a whole rang of business people over their career. Chances are when people move to a new position they may be looking for people with a certain skills set. Where do you think the most likely place they are going look? More and more I’ll bet it is via Linkedin. One of the other powerful features of Linkedin is the ability to write testimonials for others. This makes recommending someone simple and easy. This also makes your profile so much more powerful when people visit because they can view all these testimonials. Like any networking tool, you simply can’t just set it and forget it. You need to keep working it, adding information, adding activities, adding contacts, etc. The more you add the more powerful ii becomes to help grow your career and/or your business. If you are not already using Linkedin then I suggest you get yourself across to the site and set up your profile. If you have a profile, but have neglected it, I’d suggest you get in there and update it. No matter what I suggest you start making Linkedin a central part of business networking strategy. and connect up with me. <img src="http://lh5.ggpht.com/-gR2MtwZbqLQ/UO4IIWRB9aI/AAAAAAAAG94/kYGIWXvHvcA/videofb3a4744e7d4%25255B4%25255D.jpg?imgmax=800" style="border-style: none" galleryimg="no" onload="var downlevelDiv = document.getElementById('0d57a3a9-3128-42ed-bde4-96ef766e07a0'); downlevelDiv.innerHTML = "
For those who haven’t heard of him he the author of the 4 Hour Work Week and the 4 Hour Body both I which I commend to people. Now Tim’s work certainly isn’t everyone’s cup of tea but a lot of what he says really resonates with me. One of the topics he deals with is the link between health and productivity. When Richard Branson was asked what one way he would recommend to lift productivity, his answer was simple – work out. Tim also mentions a great book (which I have also read) called “Spark: The Revolutionary New Science of Exercise and the Brain” which demonstrates the link between improve brain function and physical activity. All this got me to thinking. Some of the smartest and hardest working people I know are also the most unfit. Imagine what they could achieve if they could improve their fitness. So many of them pooh-pooh the idea regular physical activity citing time constrains and workloads, etc. My response to that is this is simply an excuse. How do I know? Well, I was in a similar boat for many years. Although I have always been physically active I did not differentiate between exercise for recreation and exercise for health. I do now. As Tim notes, exercise for health does not necessarily mean absolutely killing yourself in the gym. It means setting some goals, developing a plan and measuring the results. As time progresses it is matter of finding out what is minimum amount of work that can be done for the maximum result. Simple efficiency if you will. Problem is that too many people don’t take the time to learn and understand their body and what works for them, they are lead by ‘popular opinion’. As Tim notes, popular opinion is wrong most of the time. Even if you dislike Tim you should at least acknowledge the process he goes through to obtain results. He tests, and adjusts. Measures and adjusts. Learns and adjusts. In recent time this is exact what I have been doing for myself (more in later posts) and I can’t tell you the improvement that it has made for me. There is no time like the present to make a change, and the secret to successful change is to make in small increments. However, just as importantly you need to MEASURE what you do so you can spot trends. Again, in the above video Tim responses to a question about what are the key characteristics of successful people. One of his observations is that they measure and record their results so they can spot trends. Let me ask you, what are you doing? and don’t forget who to call when you need help with Office365 (especially SharePoint), that’s right me (director@ciaops.com). An excellent book on SharePoint 2010 that cover a wide spectrum of topics. It would be suitable for most people who want to better understand what SharePoint 2010 can offer. The main focus is on the SharePoint Server 2010 product rather than SharePoint 2010 Foundation but that doesn’t mean that it still isn’t relevant for Foundation users. It covers the whole gambit from installation to branding and customization. The book contains plenty of technical information as well a tutorial style walk throughs to help you better understand exactly what the capabilities of SharePoint 2010 are. I especially like how the SharePoint terminology and functions are described and explained in detail by the author. In summary the book is a a valuable edition to any SharePoint administrator’s library. I read this on my Kindle (also available via the CIAOPS Amazon Affiliate store) and found no major issues. Some of the screen shots were a bit small on the Kindle device but not totally illegible. If I wanted to see more details on the images I simply used my Kindle PC or iPad app. and register to avoid disappointment. Remember that all attendees get a 12 month subscription to my SharePoint Operations Guide (www.wssops.com) which gives you access to 2,000+ pages of documentation, hours of video tutorials, links, best practices and more. Apart from all meals and refreshments on the day attendees also receive a hard disk crammed with virtual machines images for training and testing, documentation and more. As soon as you sign up you’ll get access to my SharePoint Operations Guide, so with a limited number of places left I’d suggest you register soon to avoid missing out. Why is this important? It demonstrates to me that Microsoft is committed to making SBS 2011 Essentials a relevant product for the market but it also demonstrates to me that they GET what is happening out there with technology. What do I mean by this? I mean that fact that world is all about apps now rather than web sites. Many products are delivered directly via their totally encapsulated ‘application’ without the need for the browser. The app manages everything from installation to management and even updating. This is exactly the model Microsoft appears to be going down with the addins for SBS 2011 Essentials. I also like the look of the Windows 7 Phone integration which allows plenty of directly control of your network right from a mobile device. Now of course all of this is blue sky mining until it becomes available but if you are interested in how SBS 2011 Essentials will connect to the cloud and how easy it appears that is going to be then I’d recommend you take a moment and have a look at this video.